It is still freezing cold here in New York and today it is snowing again. It seemed even colder yesterday and the day before that. It would be nice if we got a little bit of a break in the weather and I cannot wait for winter to be over already. For now, we’ll just have to deal with it and that means more warm and hearty meals. Yesterday it was the bean stew recipe, today it is a recipe for lentil soup. Again, I was going for soup recipes that were quick and easy and didn’t need all day to cook or prepare. I found this one from Alton Brown for a simple lentil soup and I wanted to give it a try. Place the olive oil into a large Dutch oven and set it over medium heat. Once the pot is hot, add the onion, carrot, celery and kosher salt and sweat the vegetables until the onions are translucent, about 6 to 7 minutes. Add the lentils, chopped tomatoes, chicken or vegetable broth, coriander, cumin and grains of paradise and stir the mixture until it is well combined. Increase the heat to high and bring the mixture just to a boil. Reduce the heat to low, cover the pot and cook the soup at a low simmer until the lentils are tender, about 35 to 40 minutes. Using a stick blender, puree the soup to your preferred consistency and serve. Just a few points about this recipe. First, you are probably wondering what the heck grains of paradise is. I love Alton Brown, but he can make use of some unusual and really hard to find ingredients sometimes. Grains of paradise is a spice from West Africa that is very much like a mix of pepper, cardamom and coriander. For the amount needed for this recipe, I couldn’t see myself going out and buying it since it can be quite expensive and the odds are pretty good I would not be able to find it locally anyway. Instead, I looked around on the Internet and saw that as a substitute many people use freshly ground black pepper or cardamom. I decided to go with the black pepper myself and just used that. Also, this time of year the tomatoes in this area are not very good, so I simply substituted a cup of canned diced tomatoes instead and I think they worked out just fine anyway. You also want to make sure that you pick over your lentils before you use them. Most of the time there is no issue at all, but rinsing and picking over them just to check for pebbles and such is always a good idea when you are using dried beans like this. Nothing spoils a meal faster than getting a rock in your soup. 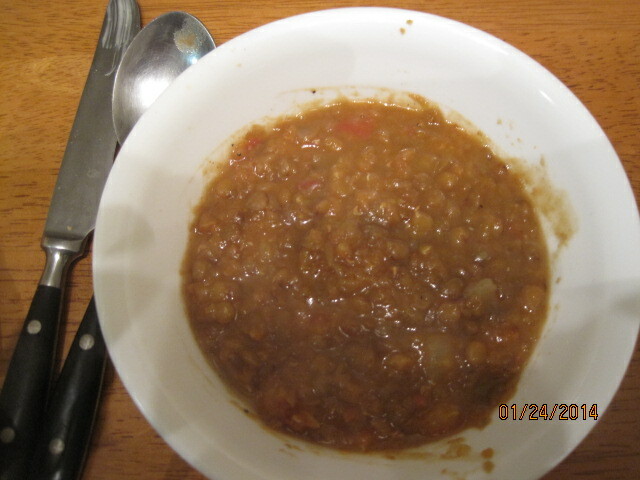 As for the soup itself, I love lentil soup and this one had a nice flavor from the coriander and the cumin. It was very filling and hit the spot and took no time at all to make. I made some cream biscuits to go along with the meal and we were all good to go with leftovers for another day. That’s all I have for today. Check back next time for another recipe. until then, enjoy the rest of your day, keep staying warm, and enjoy your meal!